TAMPA, Fla. — Steven Stamkos had three goals to become the first player from the 2008 draft to reach 700 points, and the NHL-leading Tampa Bay Lightning won their seventh consecutive game by beating the New York Rangers 6-3 on Monday night. Stamkos scored power-play goals that tied the game in the first and second periods. The centre completed his ninth hat trick and first since Oct. 13, 2014, from the slot at 10:41 of the third. The Lightning star, coming off a two-goal, two-assist outing in Saturday night’s 7-1 win over the Colorado Avalanche, has 701 points in 696 career games. He joins Martin St. Louis (953) and Vincent Lecavalier (874) as the only Tampa Bay players reaching the 700-point milestone. Ryan McDonagh had a go-ahead goal, Anthony Cirelli had the other two Tampa Bay goals, and Louis Domingue made 23 saves. Kevin Hayes had two goals and Jesper Fast also scored for the Rangers, who have lost six of eight (2-5-1). Henrik Lundqvist stopped 30 shots. New York defenceman Kevin Shattenkirk left in the second period with an upper-body injury. He took a check around the left shoulder. Stamkos scored from the left circle while falling down at 6:19 of the second before McDonagh put Tampa Bay up 3-2 with 7:18 left in the period. Cirelli extended his goal streak to three games 24 seconds before Stamkos’ third goal of the goal. Fast and Cirelli, with an empty-netter, had late third-period goals. The Rangers took a 1-0 lead 12:19 into the game when Hayes had a backhander from the left circle deflect off McDonagh’s skate. After Stamkos scored at 14:09 of the first, Hayes made it 2-1 with a rebound goal just 58 seconds later. The Lightning went 2 for 6 with the man advantage. New York failed to score on its lone power-play. NOTES: New York has been ahead after the first just seven times (3-3-1). . 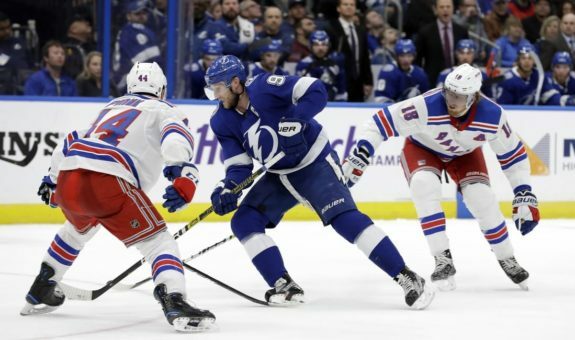 Lightning RW Nikita Kucherov had an assist and has 22 assists and 27 points over his 14 games. . Rangers RW Mats Zuccarello (groin) sat out his seventh consecutive game but is nearing a return. . Tamp Bay is 9-0-0 against the Metropolitan Division. Rangers: Return home Friday night against Vegas. Lightning: Host Toronto Thursday night.